The Western Distributor, not to be confused with the West Gate Distributor, is a planned $5.5 billion toll road linking Melbourne’s West Gate Freeway with the Citylink tollway. Watch TV News compilation here. 30 April 2015 Transurban surprises transport experts with the announcement of the market lead proposal. The tollway proposal came just 5 months after the Andrews government won the Victorian state election. They took a promise to the election to build the West Gate Distributor, a project that will now be superseded by the toll road plans. Stage 1 of the West Gate Distributor is going ahead with an upgrade to Shepherd’s Bridge and intersection upgrade to Moreland Street. Stage 2 of this project is now superseded by the Western Distributor plans. The Western Distributor features a tunnel under Yarraville with direct connections to the Port of Melbourne. At the announcement of the project, Transurban estimated that the project would remove up to 50% of trucks off residential streets in the inner west. 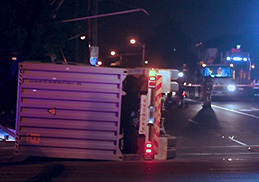 Permanent 24 hour truck bans on residential streets – The Western Distributor must, on completion, see the immediate implementation of permanent 24 hour truck bans on residential streets in Melbourne’s inner west. These roads are Williamstown Rd, Francis Street, Somerville Road, Buckley Street and Moore Street. World’s best practice filtration of vent stacks – It is not simply enough for the vent stacks to comply with current Victorian EPA regulations. Australia lags behind European and USA regulation for air pollution, particularly ultra fine particles such as 2.5 micrometers and smaller. These are the particles that cause the most severe health impacts. A tunnel provides an opportunity to remove these particulates before they enter the air shed. There is no safe level of exposure to diesel exhuast and with the high number of trucks this tunnel will carry combined with its proximity to a residential area, filtration is the only way to protect the health of the community. We demand that this project achieves a world’s best for air pollution mitigation. The Victorian government, working with Transurban, has an opportunity to build a project that actually improves health outcomes for a community impacted by freight pollution. This is their chance to show, not just our community, but also the wider Australian public how a large-scale road project can deliver a great outcome for an inner city community impacted by air pollution. Watch MTAG president Samantha MacArthur talking about the project here. 20 September 2015 Transurban announces a design update for the Western Distributor that featured a shorter tunnel with a portal in Hyde Street Reserve that features Stony Creek. Transurban said the redesign was to accommodate placarded loads (trucks with hazardous loads that are banned from tunnels). Instantly the project went from one with little community opposition, unheard of for a freeway proposal in Melbourne, to one with broad community opposition owing to the loss of precious open space. A new community group – Concerned Locals of Yarraville – voiced opposition to the portal being close to housing. Friends of Stony Creek also voiced their opposition to the project’s potentially severe impacts on the Hyde Street Reserve and Stony Creek. Listen here to an interview featuring MTAG’s Martin Wurt with Waleed Aly on 774 ABC. Read an Age article or an ABC News article. 8 December 2015 The Andrew’s Government gives the Western Distributor proposal the green light. They announced they will partner with Transurban to build the Western Distributor. 24 March 2016 The Andrew’s state government announces a new consultation process for the projects design, including the short or long tunnel options with a number of other options including five options for the Hyde Street connection. MTAG does not support the shorter tunnel option. A shorter tunnel means loss of open space in the Hyde Street Reserve and increased noise and air pollution for the nearby community. This is simply not acceptable on any condition to us. The inner west already has a deficit of open space compared to most parts of Melbourne. MTAG believes it is crucial to the well being of our community to preserve our existing open space. The communities of Melbourne’s inner west have for decades been carrying an unfair burden in terms of the impacts of freight movements in and out of the Port of Melbourne. We firmly believe that any new infrastructure such as the Western Distributor, which offers solutions to the impact of port trucks, must not come at a further cost to our community. Over the past two decades we have carried more than our fair share of the burden in noise, pollution, loss of amenity and negative health impacts of truck freight movements. It is inequitable to expect our community to lose precious open space as an outcome of being provided with a solution. A shorter tunnel design will decimate the Hyde Street Reserve in terms of elevated roads and the placement of the tunnel portal itself. The main feature of the Hyde Street Reserve is Stony Creek. The short tunnel’s multiple lanes of overhead-elevated roadway will destroy this amenity. The short tunnel option will also have a detrimental impact in terms of noise and air pollution for the adjoining residential areas, the Yarraville Community Centre and people using the reserve. The longer tunnel option limits the footprint of the planned toll road to the existing freeway reserve and has the least impact on Stony Creek. Any negative impacts that this design has in terms of disruptions to existing traffic flows is simply a cost that all Melbournians’ need to share. Mitigating these short-term disruptions should not equate to the permanent loss of open space for residents in the inner west, not just for us but also for future generations. Lost open space can never be replaced. Melbourne’s population is growing rapidly and is projected to continue for decades to come. Open space is critical to a community’s health and livability, MTAG demands that our open space is not traded for road infrastructure. Read an Age article here. 9 Juy 2016 The Andrew’s government announces the reference design for the Western Distributor that will go out to tender and to the EES. We are pleased that the long tunnel option is chosen with ramps on either side that hug the freeway, minimising impacts on both Hyde St Reserve and the Hope St Kinder. However our sticking points remain – We need permanent 24 hour truck bans on residential streets once the road is built and world’s best practise tunnel filtering technology. See a TV News compilation here. After all, colleges, clean air, the cost of living, quiet neighborhoods are really substantial. But, health is more important . There are numerous of reputable online pharmacies that will offer legitimate discounts. Let’s talk about variant medicines. Many doctors ask about propecia results. You may have heard about generic viagra 100mg online (Read more finasteride reviews). Most consumers possibly believe the forcefulness of Finasteride is well documented. What remedy does treat the medicinal condition? So if you are experiencing the problems, it is essential to see a qualified pharmacist instantly for a complete medical expertise. Don’t forget, the best way to avoid hokey medicines is to buy recipe medicines like Finasteride from a trustworthy online service with which you are relaxed.